This project, in the country’s north east region, was part of the Singapore Government’s ABC– Active, Beautiful, Clean – water initiative to transform areas of water into places of beauty and recreation. 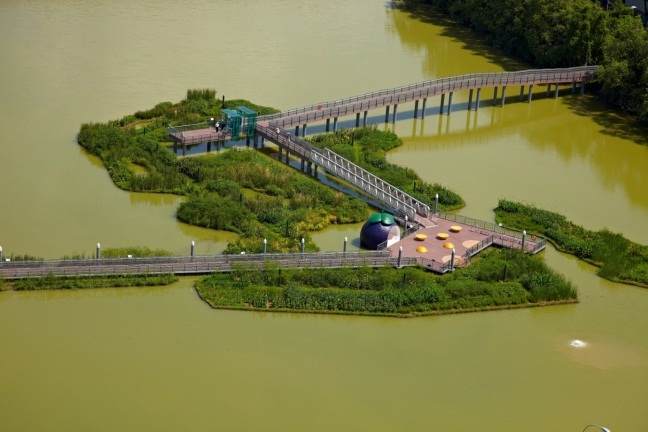 It began with barraging the Sunggei Punggol estuary to create a freshwater reservoir which was then developed to create a leisure facility, improving the quality of life for people living in nearby intensive urban developments. The grand design included installation of a fixed bridge and floating walkway across the reservoir to residential areas with community recreational facilities on the other side. Through the global network we have in the floating media industry, we were subcontracted by Singapore’s – Marina Technology and Construction PTE Ltd to provide floating media to surround the walkways to meet the government’s ABC initiative. The media we created for this site were made up of 380 modules, totalling 2400m², linked together to provide a shaped ‘island’ that wraps around the walkways. The floating media were fixed to piles driven into the riverbed by a series of aluminium brackets attached to the modules. This ensures stability in extreme conditions such as at times of strong river currents, tropical storms, and flooding. We worked closely with local landscapers, combining their design skills and knowledge of local fauna with our botanical expertise to produce working drawings and planting plans that would meet the lavish standards required for the project. A critical requirement of the design was the provision of direct walk-on access for staff to maintain the media to park-like quality. We met this need through the unique and patented technology that gives our media the strength and buoyancy required to allow safe access. Although we had a team member based in Singapore throughout the project, the success of our contribution is compelling evidence of our outstanding ability to manage from a distance. We overcame challenges including language barriers, differences in quality standards and, with limited storage available in Singapore, logistical skills in organising back-to-back shipping and installation.